Finland’s Ålandsbanken sold its largest single tranche covered bond on Tuesday, a Eu150m four year issue backed by a Finnish cover pool, and plans to return before year-end with a krona-denominated inaugural covered bond out of a Swedish cover pool. After investor meetings earlier this month, leads Commerzbank and Danske began taking indications of interest (IOIs) on the Eu100m minimum four year deal on Monday afternoon with initial price thoughts of the 20bp over area. IOIs of close to Eu100m were taken and the books were then opened with mid-swaps plus 20bp area guidance on Tuesday morning, and a Eu150m deal ultimately re-offered at plus 20bp on the back of a Eu170m order book. She said that, faced with the strong demand, the issuer was faced with the alternatives of either increasing the size from the Eu100m minimum or tightening pricing. German accounts took 60% of the issue, the Nordics 27%, Switzerland and Lichtenstein 3%, Austria 3%, Asia 3%, the Benelux 3%, and the UK 1%. Banks and pension funds were allocated 40%, funds 28%, central banks and official institutions 23%, and insurance companies and pension funds 9%. She said that the choice of a four year maturity helped attract the broadest possible range of investors. The issuer held investor meetings in Germany on 9 and 10 September and in Helsinki on 16 September, allowing time before its ultimate new issue to make sure investors had all the necessary information and for some to get credit lines in place. Huhtala said that it was not easy to calculate the correct re-offer level, but that the level of 20bp took into account the smaller issue size on offer than benchmarks from other Finnish issuers and also incorporated a new issue premium. 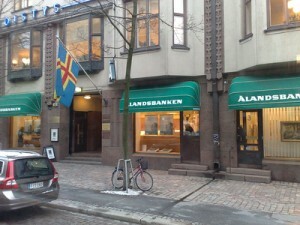 Ålandsbanken is now planning for the fourth quarter another issue, in the Swedish krona market, out of a Swedish cover pool set up in the second quarter. “The development in the bank has been such that the biggest growth in the business has been on the Swedish side, and so that is where we still might have funding needs in 2014 or early 2015,” said Huhtala.